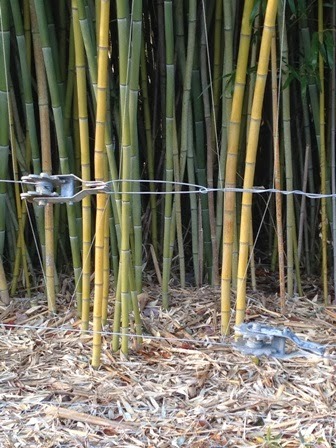 This is a 3-year follow-up to my July 1 and July 9 posts from 2010, where I described a simple “fishing line” deer fence I made with five runs of monofilament line that proved a failure. But I liked its low cost and low visibility and was determined to tweak the original design to have a fence that would keep out deer, rabbits, and groundhogs. I stretched 3-ft. wide chicken wire along the base to provide protection from rabbits and groundhogs (those rascals will chew through the black propylene “deer netting”). The bottom of the chicken wire is buried about 6-in. down in the soil. I replaced the horizontal runs of fishing line with runs of 14-gauge wire spaced 12-in. to 18-in. apart, from the top of the chicken wire to the top of the fence (around 7-ft.). Then I wrapped fishing line (20# test) from the lowest wire to the top wire in a somewhat random pattern. The fishing line has broken in places (mostly due to me hitting it with tools) but is easy to repair. We have a fairly high deer population in my area and my fence is barely 7 ft. in places. I’ve gone through 3 complete years with no deer, rabbit, or groundhog getting in. The fishing line is pale green and I doubt they see it. Maybe they bump into it and get spooked? I have 6-in. 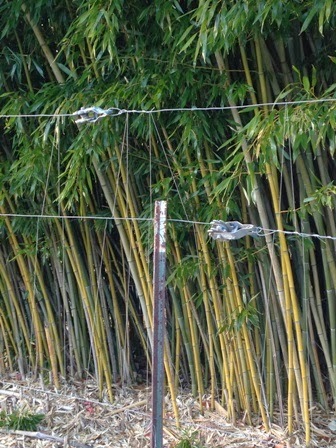 diameter wood posts at the corners (10 ft. tall with 2 ft. in the ground) and some 8-ft. metal T-posts between. I use in-line strainers to maintain tension in the horizontal wires. It is fairly unobtrusive. Been doing this for years and it really works. My husband is a fisherman so I had line at my disposable. However, we use 10 lb test blue fluorescent Stren that they see at night only. It spooks them and they change their path at night. If all that work, why not use electric ? Great idea to use fluorescent line. I had a 2-strand electric but deer still entered the garden. Mine was solar-powered and the charge on the polywire was not that great. I needed more peace of mind from my fence. You have given this girl a LOT of hope and I will be a stringin this weekend. I counted NINE last weekend just waiting for me to leave my house and have Deerfest 2014. So I will try this so I will not have to use awful chemicals!!! Thank you, thank you! 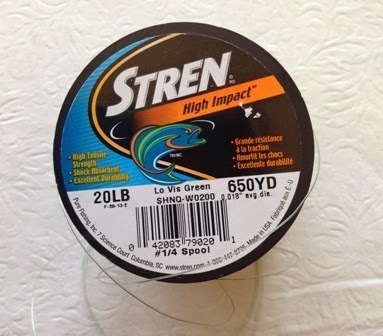 What a timely post – I have had the fishing line out on the counter for a few days, intending to see if it would work to replace the weathered bamboo I took down. I was thinking along the lines of hanging strips of cloth to flutter and alert the deer that it is there- and thought it would look like a used car lot. 🙂 I love the up and down approach, from wire to wire. 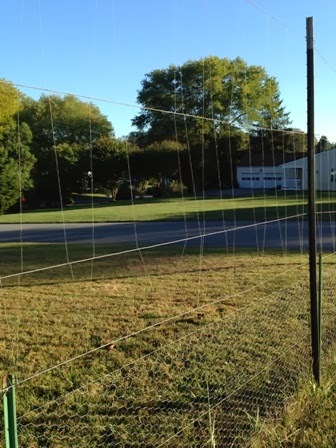 We just put up portable 4×12-ft. fencing panels, held up by T-posts and wire. Even have made a makeshift gate. We are overrun with deer and rabbits, but have not had any problems from either for 6 years now. However, can't figure out how to deter gray squirrels and crows from overhead onslaught of the ripening ears of corn. Guess the answer is plant enough to share with them all! Would love to hear from people this summer about fencing success and failure. Birds and squirrels are so tough to defend against. If they only took “their share” we could live with it! Nice post…This is the great idea to use flourescent line. Three years later and no deer have entered the garden. I spend about 20 minutes twice a year repairing broken line. Saw a YouTube vid of an older gent explaining his SINGLE 30 lbs line strung around his garden at about thigh height. He said the deer are spooked by the 'unseen' touch of the line and back away. I tried it this last year on a newly planted orchard area. And it worked! Had game cams set up to document success or failure and it kept them out until the line broke about 8 months later and little baby deer came bounding into view. I like this more elaborate fence and will give it a try in conjunction with the single line. Whatever work is put into this is worth it when you consider not only the dollar investment of crops but more importantly, the TIME we invest growing it all. Let us know how things work out. Would love to share photos of other adaptations of this old, inexpensive technology. What did you do for a gate? Jon…what a great set-up! We hope to construct a similar enclosure for our garden, but we don't know what to do for a gate/entrance. Could you please share what you did? I made a simple wood frame covered with chicken wire and attached it with hinges to a support post. 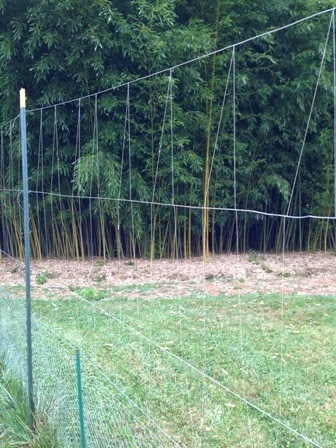 The gate is only 4 ft. high so I attached four bamboo poles to keep deer from jumping through.